Trump also decried the corrosive tone in politics that may have contributed to such threats — even as he’s frequently lobbed sharp jabs and hurled political insults at his usually raucous rallies and on Twitter. In the same remarks, however, Trump criticized mobbing people in public places and destroying public property — both apparent references to recent GOP criticisms of Democrats and liberal protesters in the final contentious weeks of the midterms campaign season. And Trump suggested the media was partly to blame for the recent conflagration in the country’s already overheated political culture and rhetoric. “Those engaged in the political arena must stop treating political opponents as being morally defective….No one should carelessly compare political opponents to historical villains, which is done all the time,” Trump said. Trump has frequently derided Clinton, his 2016 opponent who he’s continued to mock in his campaign events nearly two years after his victory over her. Chants of “Lock her up!” remain staples of his rallies, and reporters at Wednesday’s rally noted the crowd did break into the familiar refrain before Trump arrived. Trump has also repeatedly mocked Rep. Maxine Waters, D-Calif., as “crazy’ and “low IQ.” Waters, who has become a liberal hero after she called for Trump’s impeachment, said earlier Wednesday that the U.S. Capitol Police had intercepted a suspicious package sent to her D.C. congressional office. 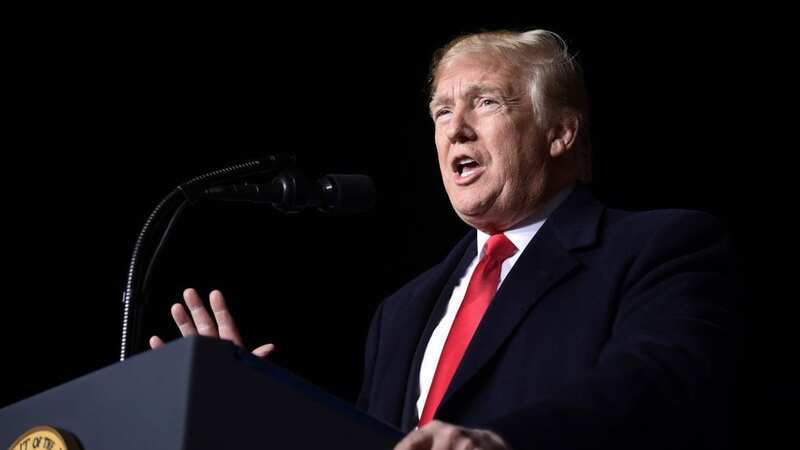 But Trump told the Wisconsin crowd that he was trying to “behave” and “be nice” and none of his usual, red-meat crowd pleasers directed at Waters, House Minority Leader Nancy Pelosi, Clinton or others were part of his repertoire Wednesday night. “We’re all behaving very well, and hopefully we can keep it that way,” he insisted. Trump and leading Republicans in Congress have called liberal protesters in the wake of Supreme Court Justice Brett Kavanaugh’s divisive confirmation battle part of a Democratic “mob” — a moniker that Trump morphed into a new GOP campaign slogan about “jobs, not mobs” in the final weeks before Election Day next month. Trump also shifted blame for such division in the country, in part, to journalists. “The media also has a responsibility to set a civil tone, and to stop endless hostility, and constant negative and often times false attacks and stories,” the president said. Trump didn’t mention the suspicious package sent to CNN — who he frequently brands as “fake news” during his campaign rallies — which caused the cable network’s New York bureau to be evacuated on Wednesday. The comments from Trump seemingly faulting the media for the spate of suspicious packages being investigate by federal authorities comes a week after the president appeared to praise a fellow Republican who assaulted a journalist last year. At a rally last week, Trump praised Rep. Greg Gianforte, R-Mont., who pleaded guilty last year to misdemeanor assault of a reporter who was attempting to ask him a question about health care. “Any guy who can do a bodyslam, he’s my kinda guy,” Trump said, mimicking throwing a person on the ground. The rest of Wednesday’s rally, in support of Wisconsin Gov. Scott Walker and Republican Senate nominee Leah Vukmir, was much of Trump’s standard campaign stump speech, touting his economic achievements and warning voters that Democrats will not be tough on illegal immigration, especially as a caravan of Central American migrants is heading for the southern U.S. border apparently to seek asylum.